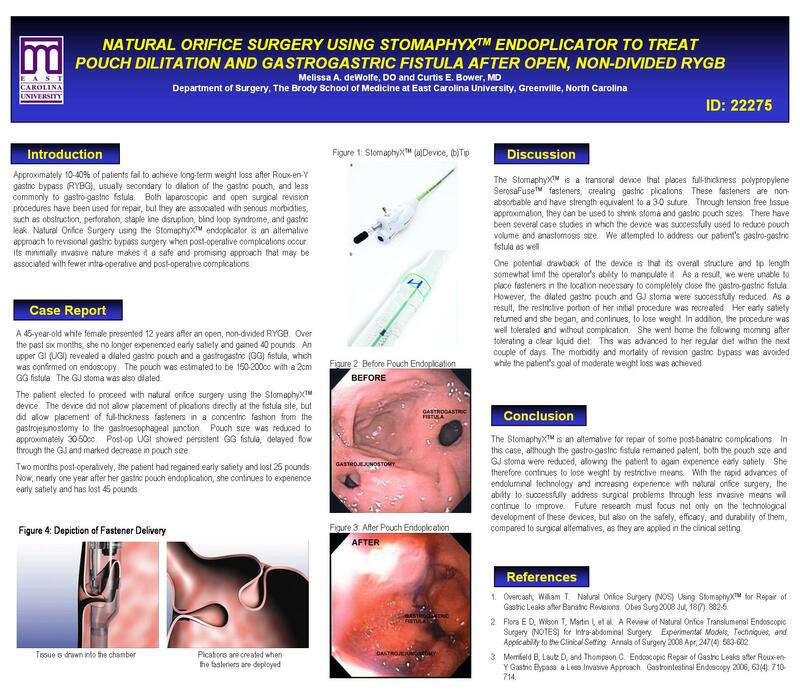 Introduction: Natural orifice surgery using the StomaphyX™ endoplicator is an alternative approach to revisional gastric bypass surgery when post-op complications such as dilatation of the gastrojejunostomy, gastrogastric (GG) fistula, and gastric pouch dilation occur. Case Report: A 45-year-old white female presented 12 years after an open, non-divided RYGB. Over the past six months, she no longer experienced early satiety and gained 40 pounds. An upper GI (UGI) revealed dilated gastric pouch and GG fistula, which was confirmed on endoscopy. The pouch was estimated to be 150-200cc with a 2cm GG fistula. The GJ stoma was also dilated. The patient elected to proceed with natural orifice surgery using the StomaphyX™ device. The device did not allow placement of plications directly at the fistula site but did allow placement of full-thickness fasteners in a concentric fashion from the gastrojejunostomy to the gastroesophageal junction. Pouch size was reduced to approximately 30-50cc. Post-op UGI showed patent GG fistula, delayed flow through the GJ and marked decreased in pouch size. At 2 months post-op, the patient had regained early satiety and lost 25 pounds. Discussion: The StomaphyX™ device places full thickness fasteners, creating gastric plications. This can be used to shrink stoma and gastric pouch sizes. One potential drawback of the device is that its overall structure and tip length somewhat limit the operator’s ability to manipulate it. In our patient, although the gastro-gastric fistula remained open, the dilated gastric pouch and GJ stoma were successfully reduced. As a result, the restrictive portion of her procedure was recreated. Her early satiety returned and she began losing weight. The morbidity and mortality of revision gastric bypass was avoided while the patient’s goal of moderate weight loss was achieved. Conclusion: The StomaphyX™ is an alternative for repair of some post-bariatric complications. With the rapid advances of endoluminal technology and increasing experience with natural orifice surgery, the ability to successfully address surgical problems through less invasive means will continue to improve.